NP-S303 plays music from PC or NAS, smartphone and a variety of streaming services, all with the amazing sound you get from a dedicated network player. Earn 269 loyalty points when you order this item. 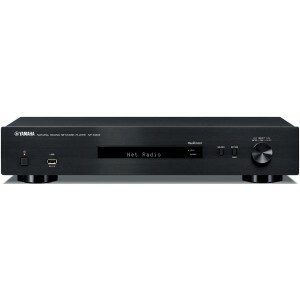 Yamaha NP-S303 is designed to introduce music-lovers to the world of network audio in a simple and easy-to-follow way. Enjoy music stored on your PC or NAS, music from your smartphone, or any of a variety of streaming services — all with this single device — with the amazing sound you get from a dedicated network player. Simply connect with your favourite amplifier and step into a new world of audio enjoyment. It’s all in the palm of your hands — with the free MusicCast CONTROLLER app. Simply tap and flick on the intuitively designed screen, and easily operate all of your MusicCast devices, as well as the NP-S303. Despite its slim body, the NP-S303 packs a wealth of know-how and technology inside, cultivated by Yamaha's long experience of Hi-Fi development. Starting with meticulously selected high sound quality parts, the signal path has been minimised, analog and digital circuits have been given completely separate blocks, and noise generation has been thoroughly suppressed. The NP-S303 supports an extensive variety of high-resolution audio formats. Feel the very breath of the vocals, bask in the airy atmosphere of a concert hall — and experience all of the performance as never before. MusicCast employs a high-performance wireless network to deliver music and audio enjoyment. It can stream digital music content from your smartphone, PC or NAS to other MusicCast devices in your home. Audio content from Bluetooth-connected smartphones or tablets can also be streamed to MusicCast devices in multiple rooms.